When we're not out traveling my family is pulling furniture together for our new home. Most parsonages come with at least a little furniture. This came with floors, walls and major appliances. Decorating the house is turning out to be the blast that I thought it would be. Thrift shop table becomes a travel scrapbook. We have a new/used kitchen table and chairs. About a year ago we picked the set up at a thrift shop. It stayed in the garage until we moved. It turned out to be a perfect fit for the dining area. The set did need some sanding and refinishing but it was sturdy and reasonably priced. Most importantly, it is made of solid wood. This allowed me to choose a travel design and be creative with it. So, guess what we did. 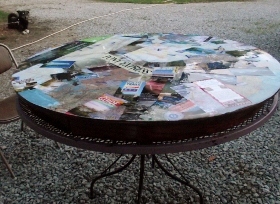 I took our travel brochures and began cutting and then gluing them to the table. The end result is a scrapbook of all of our travel experiences. It includes tourist attractions, trails, and hotels. And, I'm not finished yet. We are going to buy new seat cushions to put on the kitchen chairs. My goal is to find them in a small map and compass print or or some other type of travel pattern. One of the latest pieces of furniture is a new futon in our living room. Eventually we are going to get a thicker cushion for it. For right now, I am hoping to find throw pillows or cushions in the same or similar travel theme that we used in the kitchen. This should help tie the décor in the whole house together. I'm checking this website http://www.cushion.com and fabric shops to find the right fabric. If I can't find anything in a travel theme the next step will be another DIY attempt. We will see how that turns out.